It’s difficult to know if the cops are watching your mobile phone’s location by using a stingray. According to new Justice Department e-mails obtained by the American Civil Liberties Union (ACLU) of Northern California, and published on Wednesday, federal investigators have been routinely using “stingrays” to catch bad guys. A stingray is a device that can create a false cellphone tower, and allows authorities to determine a particular mobile phone’s precise location. Stingrays aren’t new—law enforcement agencies nationwide are believed to have been using them for years. But one e-mail in the new trove reveals something brand-new: that the Feds were not fully clear about the fact that they were specifically using stingrays (also known as “IMSI catchers”) when asking for permission to conduct electronic surveillance from federal magistrate judges. A press representative from the United States Department of Justice did not respond to Ars’ request for comment. Groups like the ACLU are concerned that unsupervised use of such technology can inadvertently collect information of people who are not suspected of any crime, nor under investigation. The ACLU intervened as an amicus in the case of a federal defendant, Daniel David Rigmaiden, who is facing dozens of federal charges of identify theft, mail fraud, and other charges stemming from an alleged massive fraudulent tax refund ring. Rigmaiden and another as-yet unnamed co-conspirator are in federal custody. A third man, Ransom Marion Carter, III, remains a federal fugitive. Rigmaiden maintains his innocence, and argues that using a stingray without a warrant is unconstitutional. “Before this e-mail, we did not know whether Rigmaiden was an outlier,” Linda Lye told Ars, explaining that little is known about the scope of stingrays’ use. Now it’s clear they have been using stingrays as a matter of course. As a result of this new disclosure, Lye has filed a motion to leave the new file with the court. Consequently, Rigmaiden filed a motion that the evidence resulting from the stingray—which allowed authorities to arrest Rigmaiden and search his apartment—be suppressed. “There’s definitely a lot riding on [his] motion,” Lye added. “The government would have to establish that there was independent probable cause without using this device to know that this was the right apartment to search.” If they can’t prove that, substantial evidence is likely to be suppressed, and that would throw a wrench into the prosecution. Between 2005 and 2008, federal investigators allege that the trio (Rigmaiden, Carter and the unnamed person) filed over 1,900 fake tax returns online, yielding $4 million sent to over 170 bank accounts. The ACLU received the group of e-mails last week as the result of a Freedom of Information Act request jointly filed with the San Francisco Bay Guardian, a local alt-weekly newspaper. On Wednesday, Lye published (PDF) the e-mails, and will formally present them Thursday to a federal court in Arizona, where Rigmaiden’s case is ongoing. As some of you may be aware, our office has been working closely with the magistrate judges in an effort to address their collective concerns regarding whether a pen register is sufficient to authorize the use of law enforcement’s [stingray] WIT technology (a box that simulates a cell tower and can be placed inside a van to help pinpoint an individual’s location with some specificity) to locate an individual. It has recently come to my attention that many agents are still using WIT technology in the field although the pen register application does not make that explicit. In December 2011, noted German security expert Karsten Nohl released “Catcher Catcher”—a piece of software that monitors network traffic and looks at the likelihood that a stingray is in use. Rigmaiden’s case dates back several years. In 2007 and early 2008, the Internal Revenue Serviceidentified a bank account at Compass Bank in Phoenix that seemed to be receiving fraudulent tax refunds under the name “Carter Tax & Accounting, LLC.” Authorities identified Carter as being involved in the possible scheme. By early 2008, undercover operatives identified another man who was dubbed “the Hacker,” as well as another as-yet unnamed co-conspirator who served higher up than Carter. They then opened a bank account for the Hacker, who unknowingly deposited some fraudulently obtained tax refunds electronically into that account. In April 2008, the second co-conspirator was arrested in Utah, and that case remains under seal. This suspect and the Hacker were deemed to be above Carter in the tax fraud ring. From April to August 2008, federal investigators tracked the Hacker via his Arizona bank account, and via packages sent to a Northern California apartment. According to the FBI, on July 23, 2008, the Hacker was served with a 50-count indictment under seal. Within two weeks, the man was arrested in Santa Clara, California, “after a foot and car chase,” following the pinpointing of his location because of the stingray. Investigators identified the Hacker, via his fingerprints, as prior felon Daniel David Rigmaiden. Rigmaiden’s indictment was initially sealed, pending cooperation with a federal investigation. But by January 2010, Rigmaiden declined to cooperate, and moved to represent himself (after firing three attorneys) and the case was subsequently unsealed. The defendant’s trial in Phoenix is slated to begin on May 15, 2013. Prior to hearing oral argument in the Proposition 8 case this morning, the Supreme Court handed down its decision in Florida v. Jardines, the other dog sniff case (Florida v. Harris was decided last month). In an opinion written by Justice Scalia, the Court affirmed the Florida Supreme Court. The Court held a dog sniff at the front door of a house where the police suspected drugs were being grown constitutes a search for purposes of the Fourth Amendment. Justice Kagan filed a concurrence joined by Justices Ginsburg and Sotomayor. Justice Alito filed a dissent joined by the Chief Justice, and Justices Kennedy and Breyer. Justice Scalia’s opinion for the Court resolved the Fourth Amendment question solely on property rights grounds, holding that bringing a dog to conduct a forensic search on someone’s porch constitutes a trespass at common law and, under the reasoning of last term’s GPS case, United States v. Jones, constituted a search subject to the limitations of the Fourth Amendment. While the general public, including the police, generally have license to approach a house’s front door (for example, to leave a flier or ask the occupant to answer a question), that license does not include an invitation to bring a dog onto the porch to search for drugs. If a member of the public did that, Justice Scalia observed, it would “inspire most of us to – well, call the police.” For that reason, the majority decision found it unnecessary to decide whether the dog sniff also violated the suspect’s reasonable expectation of privacy. When the police trespass onto private property to conduct a search, the Fourth Amendment applies regardless of whether the trespass also invades someone’s reasonable expectation of privacy. Justice Kagan’s concurrence was devoted to explaining why, in her view, the case was an easy one under either a property- or privacy-based Fourth Amendment test. No one would think it reasonable for a stranger to come to one’s porch with a pair of high powered binoculars and peer through the windows. In the concurrence’s view, the dog sniff in this case was no different and no less an invasion of the occupant’s reasonable expectation of privacy. The four Justice dissent found no support in the common law for the majority’s conclusion that the police conduct here constituted a trespass. The majority acknowledged that the public, including the police, have license to approach the front door. Justice Alito found nothing special about the fact that the police brought a drug sniffing dog with them (after all, “Dogs have been domesticated for about 12,000 years; they were ubiquitous in both this country and Britain at the time of the adoption of the Fourth Amendment.”). The dissenters also did not view the dog sniff as invading any reasonable expectation of privacy given that one can expect that odors will waft outside of a house and, possibly, into public areas where there is no question a dog could sniff for evidence of drugs without constituting a search. Members of California Families to Abolish Solitary Confinement (CFASC). Kneeling from left to right: Beth Witrogen and Michele Martinez; Standing: Cynthia Machado, Liz Evans, Irene Huerta, Becky Padilla, Pickles Camacho, Dolores Canales. Carol Strickman, Staff Attorney at Legal Services for Prisoners with Children in San Francisco. Photo courtesy of Revcom.us. About 80,000 American prisoners spend 23 hours a day in closed isolation units for 10, 20 or even more than 30 years. Now, there is growing evidence that such isolation causes mental breakdown, and the Federal Bureau of Prisons has decided for the first time to review its policies on solitary confinement. A court has just awarded $15.5 million to a man left in solitary for two years. The United Nations has labeled the practice as torture. Yet most Americans will not hear about it, or they will gloss over it without much thought and go back to their daily routines. But the U.S. has a higher number of inmates in solitary confinement than any other democratic nation in the world. The 80,000 include men, women, and even children. “Solitary confinement. When we use that term, what we’re talking about is placing the prisoner in a cell for 22 to 24 hours a day, who does virtually all the functions of life in that cell. [They are] only let out for a shower, maybe brief exercise, alone, and a visit if he or she ever has one, possibly for medical,” said Carol Strickman, staff attorney at Legal Services for Prisoners with Children in San Francisco. Dolores Canales, co-founder of California Families to Abolish Solitary Confinement, talks about the SHU, Special Housing Unit, as solitary confinement is frequently called. The practice was first reserved for the most violent inmates, but now prisoners are being subject to solitary confinement based on factors like race, religion and sexual orientation, according to some observers. “It’s difficult to imagine without ever having experienced it. It is a type of punishment and torture that is completely unnecessary. It’s in violation of the Eighth Amendment and in violation of international law,” said Carlos Villarreal, executive director of the National Lawyers Guild, SF Bay Area Chapter. An estimated one-fourth of those who are placed in solitary confinement are mentally ill. 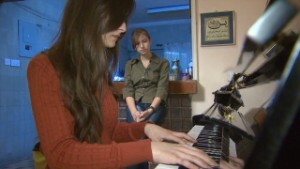 Some went in with previously existing mental disabilities, while others have had breakdowns because of the conditions. “It’s not just mental torture, but physical as well. [It] affects your bone density, your eye sight, your hearing. They don’t even allow it for a lot of animals,” said Canales. According to studies, at least half of all prison suicides take place in solitary confinement. Aside from the mental health concerns, the bipartisan Commission on Safety and Abuse in America’s Prisons concluded that the practice of solitary confinement is linked to increased acts of violence in prisons. Other research shows a link to habitual relapse into crime. Furthermore, it has been found that keeping prisoners in solitary confinement costs two to three times more than keeping them in the general population. “Our position is that there are far too many people in prison. [These] major problems [are] because of the epidemic of incarceration in the United States.” said Villarreal. “They’ve always been able to brush it under the rug. For years, the (California Department of Correction and Rehabilitation] budget was never questioned. But now we’re in such a mass financial crisis.Look at the numbers of what’s being spent in our prison system, and the numbers are tripled because of solitary confinement,” said Canales. In California, prisoners linked to gangs are held in solitary confinement with indefinite sentences. According to prisoner support groups, over 500 prisoners in California have spent over 10 years in solitary, and over 70 prisoners have spent over 20 years in the SHU. “The criteria that are used to put someone in solitary confinement are very broad. People are not Hannibal Lector, that doesn’t exist in real life, but we treat a lot of people like that’s what were dealing with,” said Strickman. While the media generally does not cover what happens in prisons, a recent series of hunger strikes in California organized by over 6,000 prisoners has captured media attention, said Strickman. There are reports that prisoner hunger strikes may resume in July if demands regarding solitary confinement and other prisoner conditions are not met. I have never posted a purely political post before, but this is worth it. The 10th anniversary of the invasion of Iraq reveals this amazing story from Hans Blix, head of the United Nations Monitoring, Verification and Inspection Commission from March 2000 to June 2003. Astonishing read about weapons of mass destruction and Al Queda terrorists. Neither existed in Iraq before the invasion. Bush must be brought up on war crimes charges. Inexcusable. 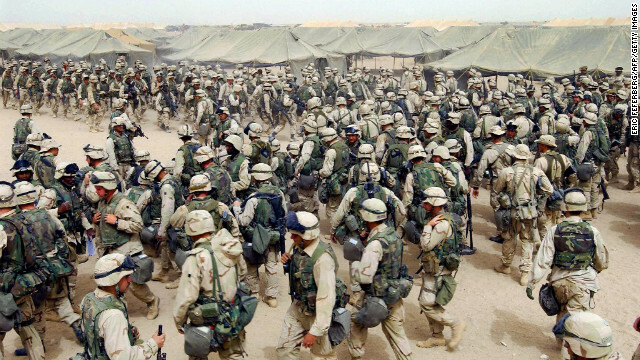 U.S. Marines in northern Kuwait gear up after receiving orders to cross the Iraqi border on March 20, 2003. It has been 10 years since the American-led invasion of Iraq that toppled the regime of Saddam Hussein. Look back at moments from the war and the legacy it left behind. 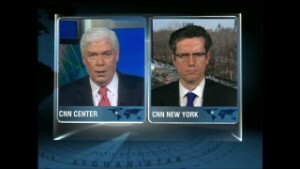 For more, view CNN’s complete coverage of the Iraq War anniversary. 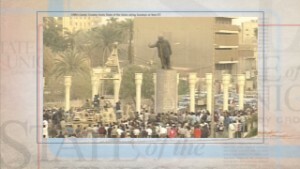 Editor’s note: Ten years ago the war in Iraq began. This week we focus on the people involved in the war, and the lives that changed forever. Hans Blix was the head of U.N. weapons inspections in Iraq (UNMOVIC) in the lead-up to the 2003 invasion. 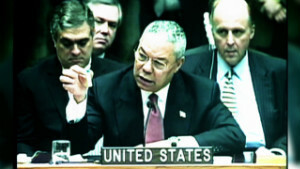 (CNN) – On March 19, 2003, Iraq was invaded by an “alliance of willing states” headed by the U.S. and UK. My U.N. inspection team and I had seen it coming — and I felt an emptiness when, three days before the invasion, an American official called me to “ask” that we withdraw from the country. While we were sad to be ushered out in the midst of a job entrusted to us by the U.N. Security Council — one that we were doing well — there was a certain relief in knowing we had all made it out safely. We had worried that our inspectors might be taken hostage, but as it turned out the Iraqis had been very helpful during our time there. So it was that a few hundred unarmed U.N. inspectors left Iraq, to be replaced by hundreds of thousands of soldiers who began an occupation that would have a horrendous cost in lives, suffering and resources. I headed the U.N. inspections in Iraq at the time of the war 10 years ago. Today, I look again at the reasons why this terrible mistake — and violation of the U.N. charter — took place and explore if any lessons be drawn. Here are my thoughts. After the terrorist attacks of September 11, 2001, George W. Bush’s administration felt a need to let the weight and wrath of the world’s only superpower fall on more evil actors than just Afghanistan’s Taliban regime. No target could have seemed more worthy of being crushed than Iraq’s brutal dictator, Saddam Hussein. Sadly, however, the elimination of this tyrant was perhaps the only positive result of the war. The war aimed to eliminate weapons of mass destruction, but there weren’t any. The war aimed to eliminate al Qaeda in Iraq, but the terrorist group didn’t exist in the country until after the invasion. The war aimed to make Iraq a model democracy based on law, but it replaced tyranny with anarchy and led America to practices that violated the laws of war. The war aimed to transform Iraq to a friendly base for U.S. troops capable to act, if needed, against Iran — but instead it gave Iran a new ally in Baghdad. The Bush administration certainly wanted to go to war, and it advanced eradication of weapons of mass destruction as the main reason. 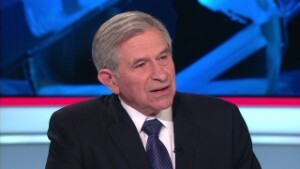 As Deputy Secretary of Defense Paul Wolfowitz has since explained, it was the only rationale that was acceptable to all parts of the U.S. administration. The WMDs argument also carried weight with the public and with the U.S. Congress. Indeed, in the autumn of 2002 the threat seemed credible. While I never believed Saddam could have concealed a continued nuclear program, I too thought there could still be some biological and chemical weapons left from Iraq’s war with Iran. If not, why had Iraq stopped U.N. inspections at many places around the country throughout the 1990s? Rumsfeld’s logic was correct, I believe, but it was no excuse for the American and British governments to mislead themselves and the world, as they did, by giving credit to fake evidence or assuming that if weapons items were “unaccounted for” that they must exist. They did not exist. We inspected many hundred of sites, including dozens that had been suggested to us by various governments’ national intelligence organizations. In a few cases we found conventional weapons — but no weapons of mass destruction. The governments that launched the war claimed to be 100% convinced that there were such weapons, but they had 0% knowledge of where these weapons were. I am not suggesting that governments should ignore information coming from their billion dollar intelligence programs. Such information is indispensable and collected with many means that are not available to U.N. inspectors. However, I think one lesson from the Iraq war is that we should pay equal attention to the results of multimillion dollar international reports that are based on extensive professional inspections on the ground. In 2003, the alliance of willing states did not do that. After the war it was reported that I and several others in New York had had our offices bugged during this period. If I was bugged, as I find very likely, I regret that those listening in did not pay more attention to what I had to say. Fortunately, enough states did listen, and the U.N. Security Council was saved from green-lighting a war that was justified by false evidence. The political leaders who have been criticized as responsible for launching the war on false premises have asserted that they acted in good faith, and that interrogation of leading Iraqis showed that the regime planned to revive its weapons program as soon as sanctions disappeared. How will history judge the Iraq War? I am not questioning the good faith of the political leaders, but rather their poor judgment in bringing war and death to a country on flimsy grounds. On February 11 — less than five weeks before the invasion — I told U.S. national security adviser Condoleezza Rice I wasn’t terribly impressed by the intelligence we had received from the U.S., and that there had been no weapons of mass destruction at any of the sites we had been recommended by American forces. Her response was that it was Iraq, and not the intelligence, that was on trial. And during a telephone chat with Tony Blair on February 20, I told the British prime minister that it would be paradoxical and absurd if a quarter of a million troops were to invade Iraq and find very little in the way of weapons. He responded by telling me intelligence was clear that Saddam had reconstituted his weapons of mass destruction program. At any rate, whatever view one took of the evidence of weapons, no one could believe in 2003 that prostrate Iraq was a threat to any other state. I cannot judge whether Iraqi prisoners were sincere when they talked about Saddam Hussein’s intentions to revive weapons programs after the end of sanctions. They might have said what they thought their Western interrogators wanted to hear. Either way, the risk of a revived weapons program was remote and hypothetical — and the U.N. foresaw a system of reinforced monitoring to continue in Iraq and to provide an alarm bell even after a lifting of sanctions. The most important lesson of the Iraq War, I think, has been that an overconfidence in military power has been replaced by an understanding that there are severe limitations on what can be achieved by military means. Intervening swiftly with arms and crippling strikes might be easy for a great power, but achieving desired political aims is another matter and exiting may be hard — the phrase “If you break it, you own it” comes to mind. Vietnam, Afghanistan and Iraq have been long and costly engagements with very mixed results. Since then prudence has held the U.S. back in the case of Libya and so far in Syria. Another important lesson is that today armed international interventions are likely to be condemned by much of the world unless they are clearly in self-defense or have been authorized by the Security Council. Iraq was neither. Unless we remember this going forward, I fear there is nothing stopping this kind of tragedy from being repeated. The opinions expressed in this opinion piece are solely those of Hans Blix. LA Times Editorial On McDavid Case Reichel, Plesser want a hearing!